buy now Fresh water is humanity’s single most critical resource. According to a recent United Nations report, stresses on water supplies aggravated by climate change are likely to cause more conflicts, and water should be considered as vital to national security as defense. The report points out that 145 countries share watersheds with neighbors and there are more than 300 transboundary aquifers from which groundwater can be extracted. order now Yet, we still do not fully understand how much water is available and how it is distributed, which is a requirement for planning how to deal with changes in climate and, particularly, in rainfall. This knowledge gap is due to limitations in the relevant science and technology, the vastly insufficient number of sensors deployed around the world, especially in developing countries, and data denial by many governments due to security concerns. cheap generic viagra Satellites, however, are dramatically changing this picture, by enabling us to measure the total mass of water on Earth and its various components, as well as to monitor how these amounts change over time. They are providing “the sole body of information that we wouldn’t otherwise have,” says Dr. Jay Famiglietti, Professor of Earth System Science and of Civil and Environmental Engineering at the University of California at Irvine and Director of the university’s Center for Hydrologic Modeling, who has been studying the subject for more than 30 years. Globally, new knowledge about water from satellites gives us insights into current conflict and future international security issues. Locally, it greatly improves the science and the practice of water resource management. GRACE (Gravity Recovery and Climate Experiment), launched in 2002, which maps gravity to detect the changes in total mass of water in large regions, and GRACE-FO (GRACE Follow On), scheduled for launch in 2017; they are both joint U.S.-German projects. See FIGURE 1. SWOT (Surface Water and Ocean Topography), scheduled for launch in 2020, will map surface water by measuring its height using radar; it is a collaboration between NASA, CNES (Centre National d’Etudes Spatiales, the French Space Agency), and CSA (the Canadian Space Agency). AirSWOT will calibrate and validate the radar for the SWOT mission, by deploying it aboard aircraft. 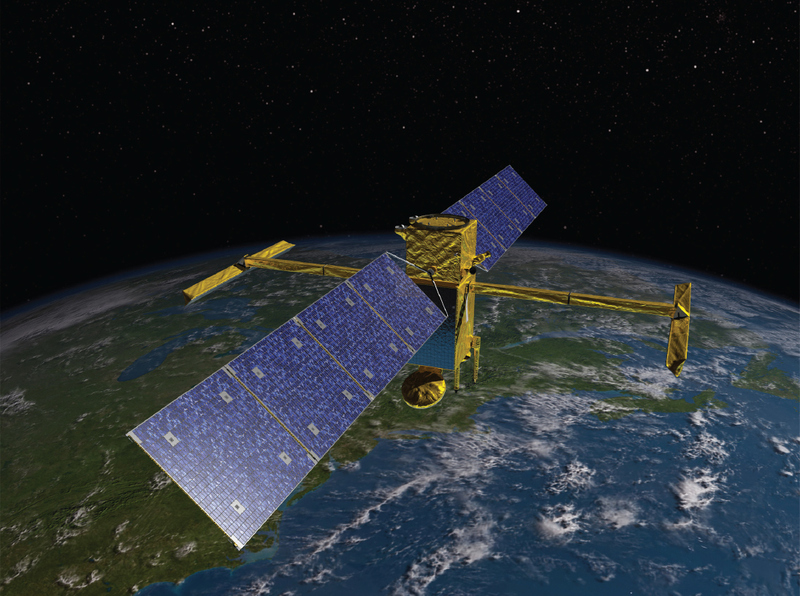 Other water-related NASA missions are TRMM (Tropical Rainfall Measuring Mission), launched in 1997, to be followed by GPM (Global Precipitation Measure- ment), scheduled for launch in 2014; ICESat-2 (Ice, Cloud, and Elevation Satellite-2), for ice sheets and sea ice, scheduled for launch in 2016; GLISTIN-A (Airborne Glacier/Land Ice Surface Topography Interferometer), flown in 2009 and proposed as a spaceborne mission; and AirMOSS (Airborne Microwave Observatory of Subcanopy and Subsurface), which began in 2012. 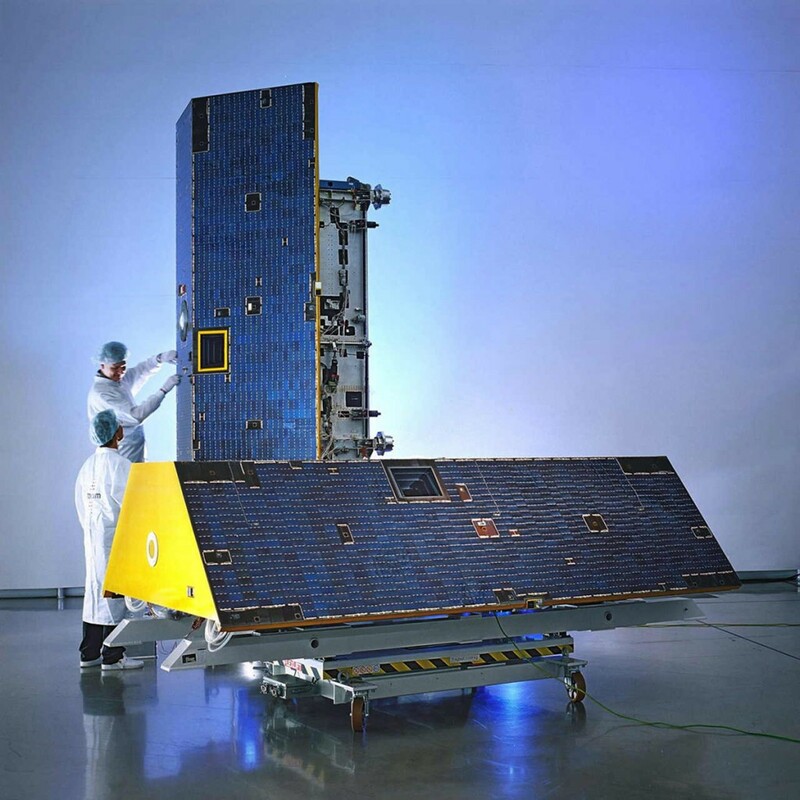 Scheduled for launch in 2014, SMAP (Soil Moisture Active Passive) will use a radiometer and a synthetic aperture radar (SAR) to provide global measurements of soil moisture and its freeze/thaw state. Another NASA sensor, MODIS (Moderate Resolution Imaging Spectroradiometer), which is a key instrument aboard the Terra and Aqua satellites, has been effective at collecting data on snow and there are plans for a Snow Water Equivalent- specific sensor. However, this article focuses only on surface and ground water. The GRACE satellites before launch. Courtesy of Astrium. The GRACE mission consists of two satellites, operating together as an instrument to map Earth’s gravity and, therefore, its mass. They are in the same orbit at an elevation of about 500 km and at a distance of 220 km from each other. 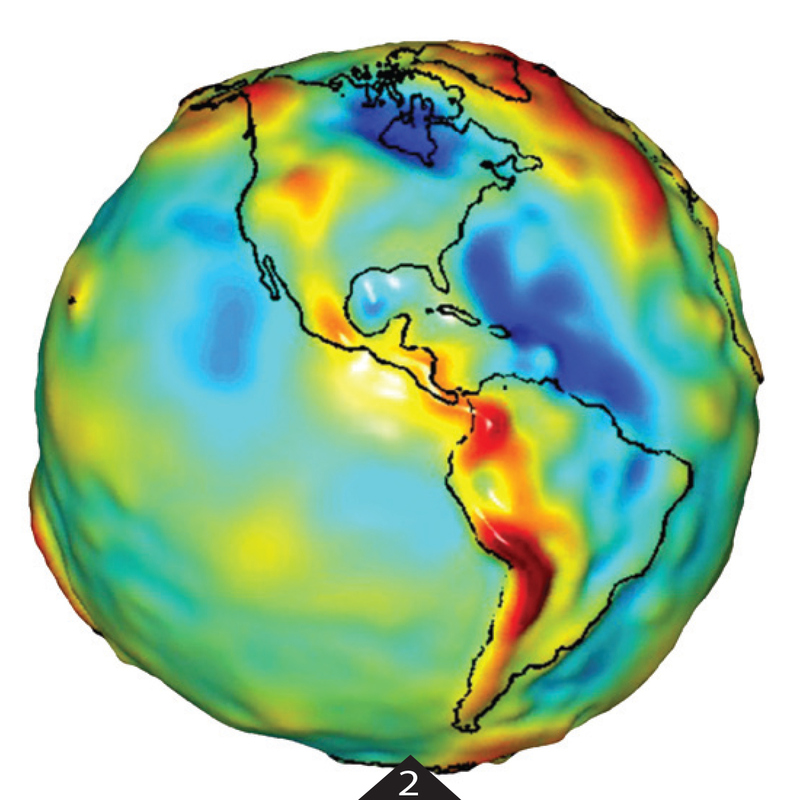 When the lead satellite flies over an area with above-average mass, such as a mountain range or a large amount of underground water, it dips lower, due to the additional gravitational attraction exerted by that mass; conversely, when it flies over an area with below-average mass, such as an ocean trench, it will rise a little higher. Its twin, following behind in the exact same orbit, will do the same. Therefore, by continuously measuring very precisely the distance between the two satellites, scientists are able to map the distribution of the Earth’s mass. Because of both what it does (using changes in gravity to map the Earth) and how it does it (using satellites not just as platforms for instruments but as the instruments themselves), GRACE is a first-of-a- kind mission. “It’s not often that you see a new remote sensing technique introduced from space like this,” says Watkins. See FIGURES 2-3. 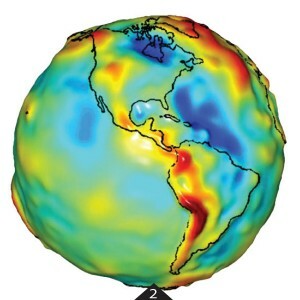 GRACE gravity model of The Americas. for Space Research and NASA. 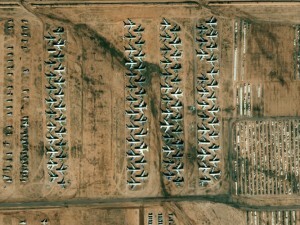 measurements are possible now that are 100x more accurate than previous models. The map on the right was produced after only 13 months of GRACE data. Using a microwave link, GRACE measures the change of distance between the satellites at micrometer resolution. “The mission scientists need to know the change in the distance between the centers of mass of the two satellites,” explains Albert Zaglauer, Project Manager at Astrium GmbH, the German company that built the satellites. “However, the measurement principle only allows you to measure the distance between the phase centers of the two antennas. So, you have a very accurate measurement of a distance of 220 km with a micrometer resolution between the phase centers of the antennas, but on each satellite, between the phase center of the antenna and the center of mass of the satellite, there’s another 1.5 m and no one knows exactly how this distance is changing.” Therefore, in order to preserve the measurement accuracy, Astrium used a combination of high-tech carbon fiber and ceramic material to build a system that is mechanically extremely stable. Another mission-critical challenge was to de-correlate the effects on the satellites of gravity changes from those of surface forces, such as atmospheric drag or the pressure from the Sun’s radiation, which can mimic changes of the Earth’s gravity field. This was accomplished by deploying aboard each satellite an extremely precise accelerometer, called SuperSTAR, with a resolution of 0.1 nano g and better, explains Dr. Pierre Touboul, Director of the Physics Branch at ONERA (Office National d’Etudes et Recherches Aérospatiales), the French national aerospace research center, which built the devices. Like the satellites themselves, the accelerometers were also built for a five year mission but are still operating well, he says. “GRACE can be seen as a climate research mission,” Watkins points out. “It helps us understand why Green- land ice is melting or why we have large-scale precipitation and water cycle changes. In addition, because you get this unique measurement of ground water, there are applications for water security and water management.” See FIGURES 4-5. 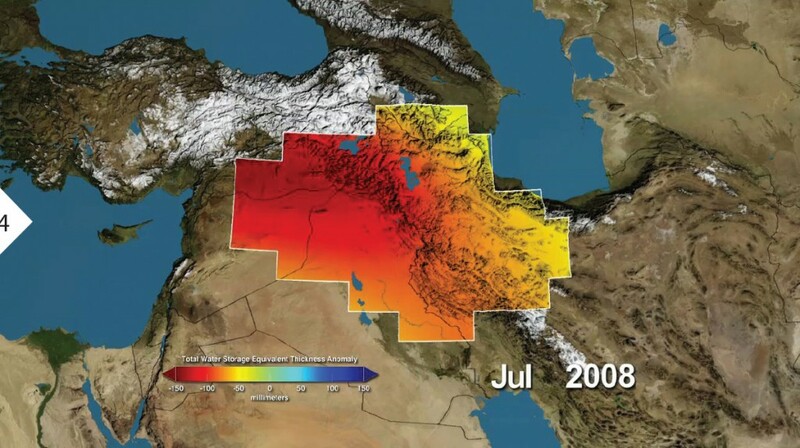 The Middle East had major losses in water storage, shown here in millimeters from Jan. 2003-Dec. 2009. Red shows drier condi- tions, with blue showing wetter conditions. The majority of the water loss was due to reduc- tions in ground water due to human activities. Image credit: NASA/UC Irvine/ NCAR. 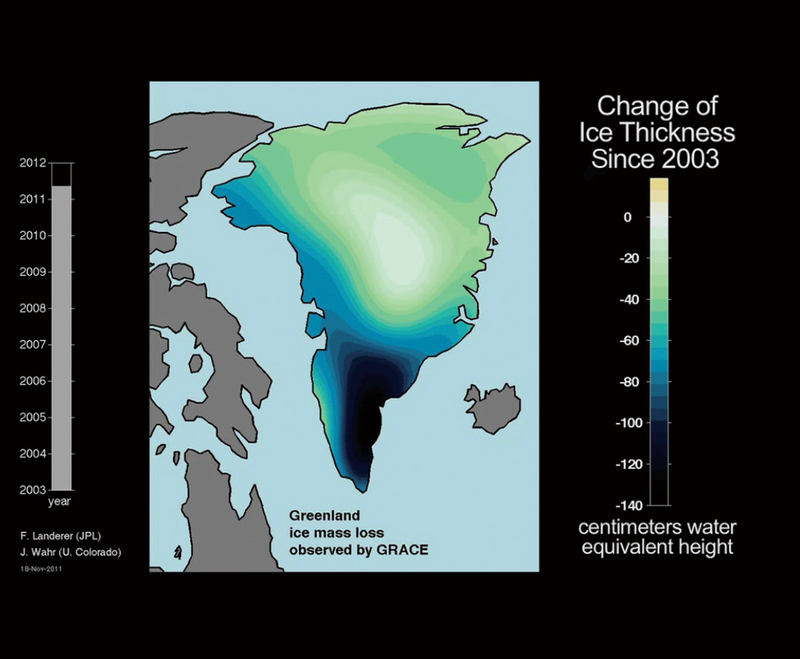 GRACE measures changing ice mass of Greenland, which has had major reductions, shown here. Image credit: NASA/JPL-Caltech/ University of Texas Center for Space Research. The SWOT mission brings together U.S., French, and Canadian members of two scientific communities: hydrologists, who study terrestrial surface waters, and oceanographers, who study the world’s oceans. It will make the first global survey of Earth’s surface water, observe the fine details of the ocean’s surface topography, and measure how water bodies change over time. 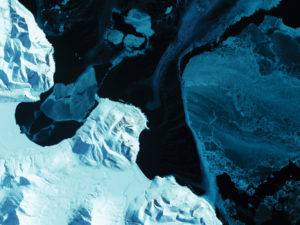 It will also benefit studies of ice sheets and of sea ice, because by measuring how much sea ice is sticking above the water, scientists can infer how much of it is below the water. JPL will analyze the data collected by the SWOT satellite. The SWOT mission will be the first one to map in detail where surface fresh water is, where it is going, where wetlands, lakes and reservoirs are, and how the distribution of water is changing—a subject about which we have “very poor knowledge,” says Dr. Delwyn K. Moller, Senior Engineer at Remote Sensing Solutions, Inc., Principal Investigator for the AirSWOT radar payload, and a member of the SWOT Science Definition Team. “We have no picture of global surface water inundation, how it changes over time, how water moves up and down, how it spreads out laterally over the surface,” says Famiglietti. “We hope to be able to understand how the heat of the ocean is transported, both vertically and horizontally, and that affects how climate change will affect the Earth,” says Dr. Ernesto Rodriguez, Principal Investigator for AirSWOT and Payload Scientist for the SWOT mission at NASA JPL. The satellite, which will have two antennas, will transmit out of one and receive on both, explains Dr. James R. Carswell, president of Remote Sensing Solutions, Inc. “By doing so, they can basically use triangulation in the simplest form, measuring very accurately the phase of these very high frequencies so the return can estimate the angle of arrival and then, therefore, measure the topography.” See FIGURE 6. Artist’s concept of NASA’s SWOT satellite, planned for launch in 2020. SWOT is designed to make the first-ever global survey of Earth’s surface water—lakes, rivers and ocean—collecting detailed measurements of how water bodies on Earth change over time. Courtesy of NASA/JPL-Caltech. The SWOT radar, called KaSPAR (Ka-band SWOT Phenomenology Airborne Radar), which is now flying as part of the AirSWOT program, actually consists of six Ka-band SARs all packaged together, says Carswell. The challenge for scientists is to figure out how useful each of these different technologies is and to combine the data as effectively as possible. 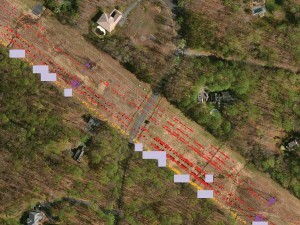 Depending on the sensor, the resolution can vary from meters to hundreds of thousands of square km. The water-related missions undertaken by NASA and its partner agencies are rapidly expanding our knowledge of water at a time when the twin challenges of climate change and population growth are making this knowledge a key to reducing conflict worldwide.